NETWORK FINALS: All of Easter Sunday’s low numbers stayed in place, except that 60 MINUTES gained 0.1 in final numbers. CABLE HIGHLIGHTS: AMC’s THE WALKING DEAD moved toward next week’s season finale with a 5.83, down 0.21 from last week, with TALKING DEAD down 0.07 to 2.34 and COMIC BOOK MEN up 0.05 to 0.40. It was TBS’s turn to air Elite 8 NCAA TOURNAMENT games, and at 3.37, the late North Carolina vs. Notre Dame game was far ahead of the 2.31 for Virginia vs. Syracuse. 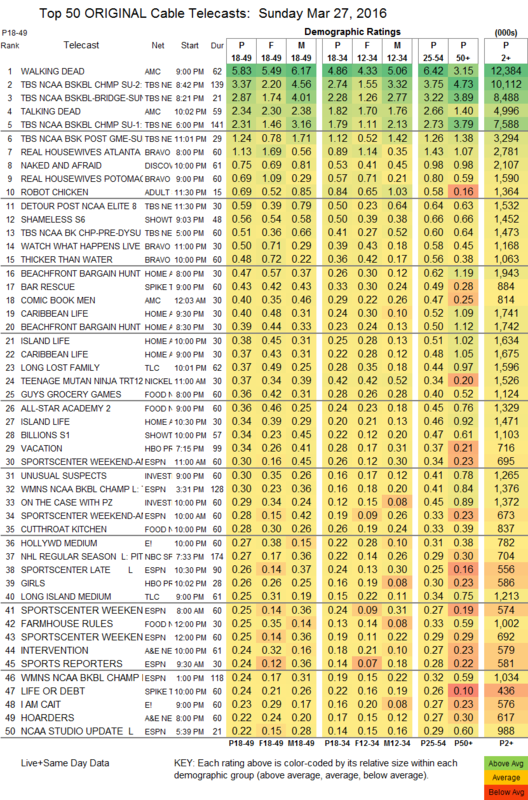 On Bravo, REAL HOUSEWIVES OF ATLANTA plunged 0.27 to 1.13, REAL HOUSEWIVES OF THE POTOMAC was down 0.09 to 0.69, and THICKER THAN WATER premiered at 0.48. Discovery’s NAKED & AFRAID lost 0.08 to 0.75. Adult Swim’s ROBOT CHICKEN gained a tenth to 0.69. On Showtime, SHAMELESS was down 0.07 to 0.56, BILLIONS fell 0.04 to 0.34, and THE CIRCUS inched up a hundredth to 0.08. On Spike, BAR RESCUE ticked up to 0.43, and LIFE OR DEBT held at 0.24. 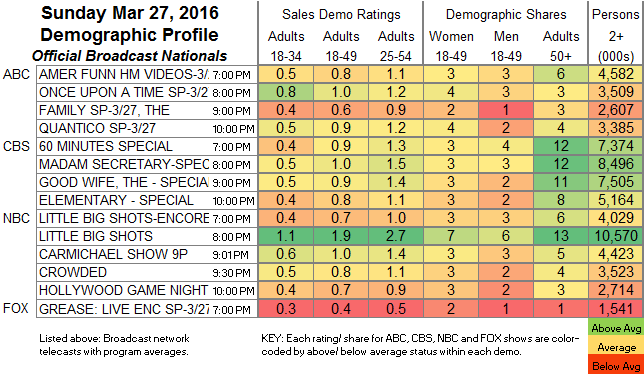 TLC’s LONG LOST FAMILY was steady at 0.37, but LONG ISLAND MEDIUM dropped 0.11 to 0.25. On Food Network, GUY’S GROCERY GAMES climbed 0.06 to 0.36, ALL-STAR ACADEMY slipped 0.02 to 0.36, and CUTTHROAT KITCHEN dropped 0.08 to 0.26. On E!, HOLLYWOOD MEDIUM outrated I AM CAIT, the former down 0.01 to 0.27, and the latter down 0.08 to 0.23. This week was only slightly less dire at HBO (but GAME OF THRONES is just a month away), where GIRLS rose 0.02 to 0.26, VINYL ticked up to 0.22, and the just-canceled TOGETHERNESS was also up a tick to 0.12, with LAST WEEK TONIGHT taking the week off. On A&E, INTERVENTION fell 0.12 to 0.24, and HOARDERS was down an even sharper 0.15 to 0.22. Hallmark’s WHEN CALLS THE HEART lost 0.06 to 0.19.